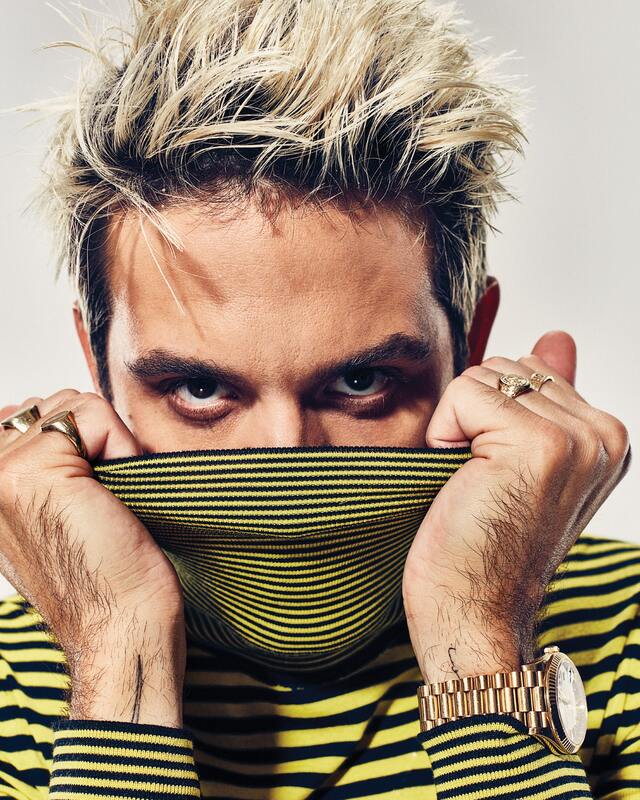 On the even of his fourth major-label album release, rapper-producer-hip-hop hottie G-Eazy opens up about life in the music fast lane. Jersey wool turtleneck, price upon request, at Dior Homme, Beverly Hills; braided band with diamonds, price upon request, at Beladora, Beverly Hills; watch and signet rings, all G-Eazy’s own. While studying music at Loyola University in New Orleans, he created mixtapes as digital downloads that grew so popular, he was opening for Lil Wayne and Drake before graduating in 2011. He released his first major-label album, These Things Happen, in 2014 and landed his first Top 10 Billboard single the next year with “Me, Myself & I.” World tours, a collab with Britney Spears, and TMZ-tracked canoodles with singers Lana Del Rey and Halsey made him full-on famous. Here’s the man who makes it look eazy being G.
Big Fit blazer, $2,125, and Space pants, $1,380, both by Raf Simons at H.Lorenzo, Sunset Plaza; cotton T-shirt, $130, at Burberry, Beverly Hills; bracelet and rings, all G-Eazy’s own. What was the first moment people took notice of you onstage? G-EAZY: I was 13 or 14 years old at a little house party for grown-ups with my friend Marty Grimes, who I still perform with. It was his mom’s birthday and she asked the DJ to let us perform. I mostly remember how totally weird it was hearing my voice coming through the speakers over the top of the beat. 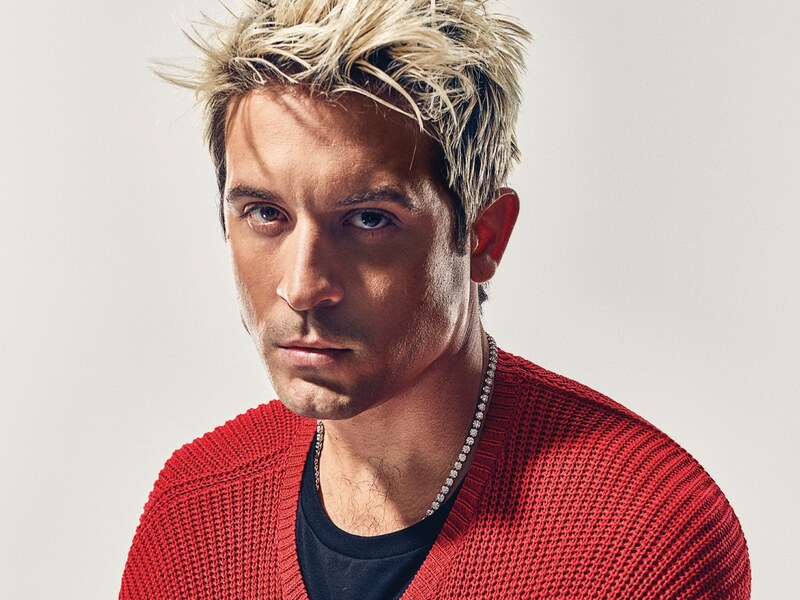 G-EAZY: I’m working on my fourth major-label release, but it feels like my 40th because of all the projects I’ve done in my life. On one hand, it’s the most natural thing in the world. But you never get used to it. If I could tell myself at a young age that I’d be in front of thousands of people at the O2 Brixton Academy in London or, my God, headlining Oracle Arena in Oakland, where I once sat in the nosebleed seats watching the Golden State Warriors—I wouldn’t have believed it. It’s still surreal. G-EAZY: Being able to provide for my family. My mom lost her job as a fine arts professor and suffers from chronic pain that’s hard for her career. I made it my mission to take care of her and send her money every month. Her comfort means everything because she struggled so much to raise my brother and me. G-EAZY: I don’t have a regular schedule like most people. Often, I’m up making music until 4 or 5 am, so I’ll sleep into the next day. But a dream day for me would be waking up in time for brunch with my friends. We’d throw something on the grill and hang out at home. Other people might say, ‘I’d go to Paris’ or somewhere, but I spend so much time on the road that home is almost a figment of my imagination. Waking up at my house in LA and having nowhere to be—that’s the ridiculous fantasy. Sweater, stylist’s own; cotton T-shirt, $130, at Burberry, Beverly Hills; necklace, G-Eazy’s own. G-EAZY: Oh, it would be with Drake, no question. He’s the best we’ve ever seen, in my opinion. His level of success in the music industry is unprecedented as far as being prolific at the highest level for more than 10 years. It’s so hard to stick around. This industry will chew you up and spit you out and can be really cruel. I’ve certainly seen the ups and downs. It doesn’t matter how hard you work. It’s this focus on staying young forever. But Drake keeps thriving. He’s like a god to me. G-EAZY: Lots of them. As soon as I could work, I worked. At 16, I worked at a hot dog place called Top Dog in Oakland. I ran the register and the grill, cleaned up the place at night; [I was] getting home on school nights at 1 in the morning. But, you know, it taught me the process of running the show myself and knowing what it means to carry the weight. And when you’re making $8 an hour at 16, it means being able to buy Air Jordans when you get your paycheck. G-EAZY: I still collect sneakers, but, yeah, my Ferrari makes me really happy to drive. It’s a black 488 that looks just like the Batmobile. I’ve gotten it up to 150, which was pretty exciting. I set it as a goal for myself to buy one, and as soon as I turned in my last album, they delivered it. Suit jacket with one button, $2,890, crew neck SL T-shirt, $350, boot-cut denim jeans, $690, and Miles booties, $1,995, all by Saint Laurent by Anthony Vaccarello at Saint Laurent, Beverly Hills; sterling silver body chain, $550, by Martine Ali at Kith, West Hollywood; bracelet, watch and rings, all G-Eazy’s own. G-EAZY: I’ve been truly blessed in my life and gotten to do so many cool things at such a young age. I’m excited about the process of working on this next album, but also of bettering myself and staying in a good headspace. When you’re a performer, especially if you’re touring, life can be kind of like Groundhog Day, where you’re doing more or less the same thing every day. You’re performing the same exact songs, and even the crowds start to look the same. Chances are it’s fun, but there’s that repetition. That repetition can be a grind and the grind can really get to you. The key is self-care. It’s hard because you position yourself to be in a place to receive these blessings, but you also have to learn to say no. You need space to quiet down. I’ve seen what happens to artists who burn out, and it’s not pretty. For me, it’s a matter of remembering that little kid who, at 13 or 14, got up onstage. It’s about prioritizing Gerald as much as I prioritize G-Eazy... and in this game, that can be tough.